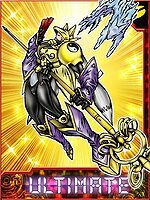 Ultimate level, God Man type, Data attribute. — Digimon Tamers: "Whirling Ultimate Flower! 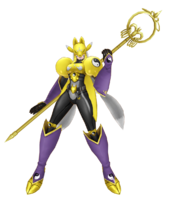 Sakuyamon Evolves"
Anime/Manga Digimon Tamers: "Whirling Ultimate Flower! 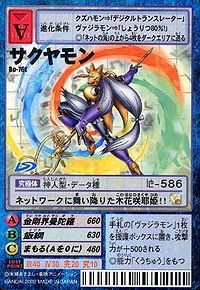 Sakuyamon Evolves"
飯綱 N/A Spirit Strike/Crusher/Dragon Helix/Izuna Summons 4 mystical fox spirits that are imbued with the powers of fire, water, wind and thunder that obey and fight for Sakuyamon. Kongoukai Mandara  Diamond Realm Mandala 金剛界曼荼羅 N/A Amethyst Mandala/Kongou Kaimandara/Golden Wall/Talisman Sphere/Crystal Sphere/Amethyst Wind/Twin Blades of Beauty and of Truth Strikes the ground with its "Kongou Shakujou", spreading a purifying barrier (in the form of a mandala, golden ring, spherical barrier, cherry blossoms, ball of lightning, or some combination thereof) that exorcises evil spirits. Kudagitsune  Fox Pipe 管狐 N/A Scepter Sends a single fox spirit at the enemy. 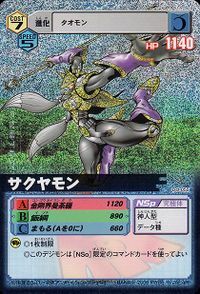 Attacks with an axe kick. 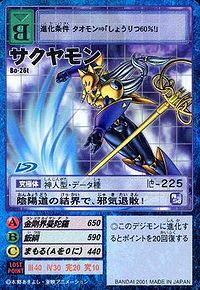 Kassengeki  Sliding Flash Attack 滑閃撃 N/A Scepter Dash Attacks by sliding along the ground while standing. 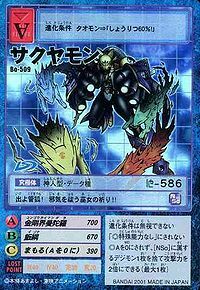 Rairyūkyaku  Thunder Dragon Leg 雷襲脚 N/A Thunder Kick Drops down like lightning from the sky and attacks with a kick. Kofūsatsu  Fox Seal Paper 孤封札 N/A Fox Card Throws paper seals at an enemy. Koenkyaku  Fox Flame Leg 孤炎脚 N/A Flaming Fox Attacks with a flaming kick from the sky. 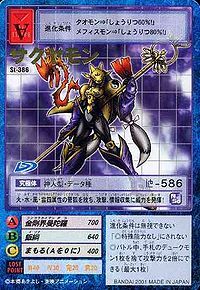 Jouenkobu  Purifying Flame Fox Dance 浄炎狐舞 N/A Fox Drive Summons blue flames to surround and burn the opponent. Fires a sphere of light from its Kongou Shakujou, which summons lightning bolts on contact with the enemy. 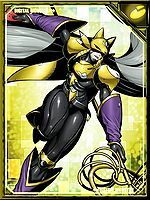 Sakuyamon was formed when Makino Ruki and her partner, Renamon, Matrix Evolved during the time they took a leap of faith to save Culumon from the D-Reaper. 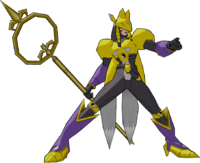 Sakuyamon appeared thereafter in almost every battle against the D-Reaper, including in the real world (after Dobermon's sacrifice gave Ruki, Takato and Jenrya the ability to Matrix Evolve there). 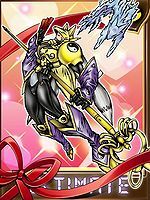 Near the end of the series, Sakuyamon passed her energy to Justimon to help him defeat the Cable Reaper, which only proved to be in vain. 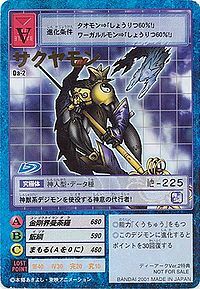 Reappeared to help fight the Parasimon. 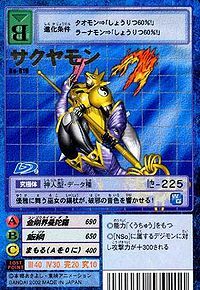 It demonstrates its power by sending its pipe-foxes, encompassing four elements: fire, water, wind, and thunder, to attack and gather information! 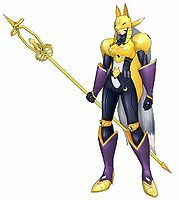 Kuda-gitsune, come forth! This priestess's prayers will exorcise evil! 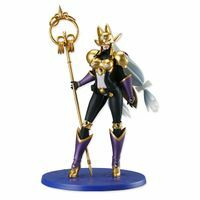 This priestess dances elegantly with its staff, which resonates with a tone that destroys evil! 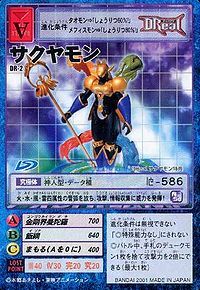 It repels evil with its Onmyoudou barrier! It flutters onto the network, Konohana no Sakuya-hime!! 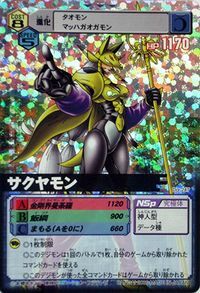 An envoy of god's will who enlists the help of God Beast type Digimon! 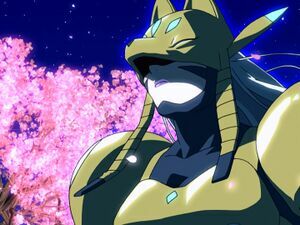 It holds the duty of a shrine maiden, acting as an agent of God's will. The pipes it hangs on its waist house four kuda-gitsune. 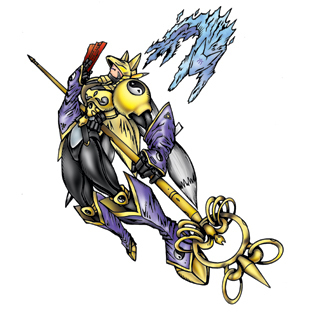 Sakuyamon uses its singing, which resounds with the sound of its staff, to exorcise evil. 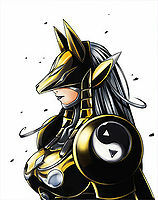 A Digimon that holds the role of a miko, acting as an agent of God's will. 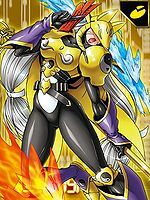 ↑ Digimon Tamers: "Whirling Ultimate Flower! 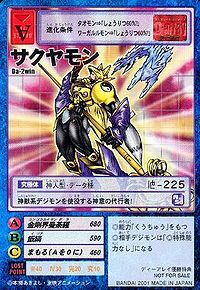 Sakuyamon Evolves"
↑ Izuna is a form of sorcery, practiced by the Izuna Shugen cult of Mount Iizuna, which utilizes Kuda-gitsune. This page was last modified on 10 April 2019, at 12:14.